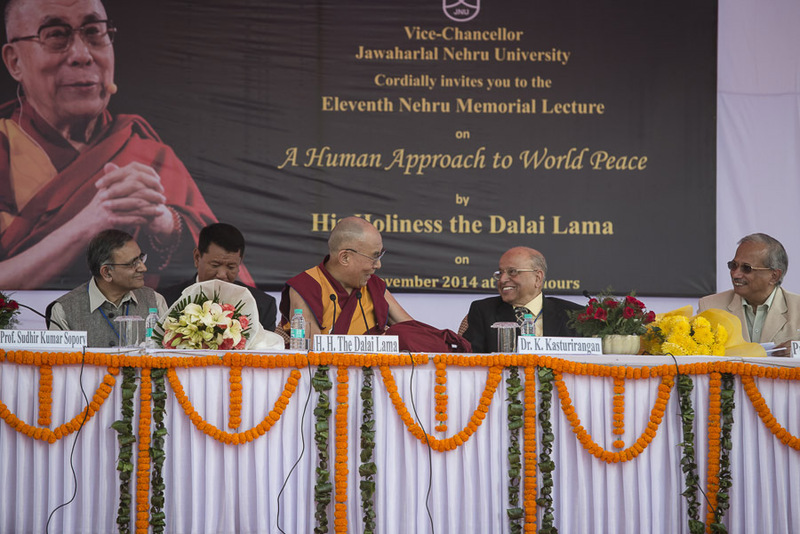 (TibetanReview.net, Nov22, 2014) – Tibet’s exiled spiritual leader, the Dalai Lama, on Nov 20 delivered the 11th Nehru Memorial Lecture at the Jawaharlal Nehru University, New Delhi. He was received by Chancellor Prof K Kasturirangan, Vice-Chancellor Prof SK Sopory and other members of the administration and addressed an audience of more 1200 students, faculty members and others. Prof Sopory remarked that this year marked the 125th anniversary of the birth of Jawaharlal Nehru, independent India’s first Prime Minister. And he said the purpose of the lecture was to advance and disseminate knowledge in accordance with Nehru’s principles of humanism, tolerance, the adventure of ideas and the search of truth. And Prof K Kasturirangan said the university that bears Nehru’s name maintains an ethos of dialogue and respect for diverse views and upheld India’s timeless value system of peace and non-violence. The Dalai Lama emphasized the common characteristics and values that all human beings share while noting that the differences among them in terms of physical features, nationality, faith, and so on were minor and secondary. 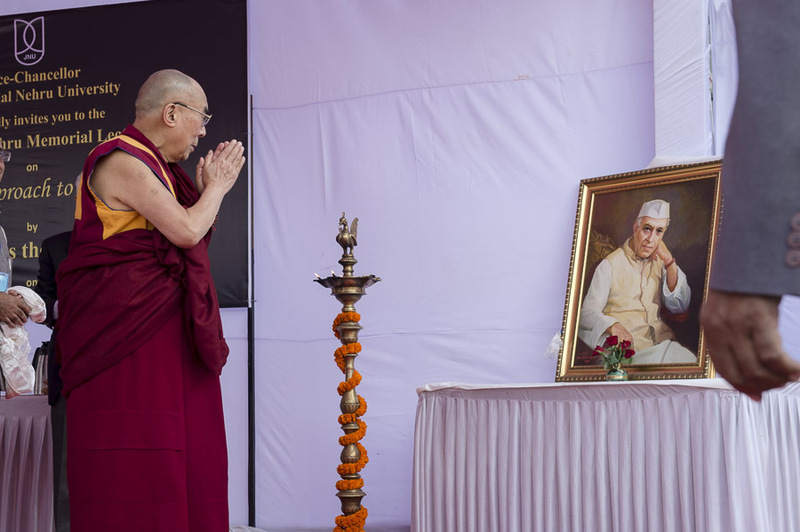 He recalled his personal meetings and interactions with Nehru, from the first time he met him in Beijing in 1954, through 1956 at Bodh Gaya and so on. He said Nehru was a great support and friend to him and the Tibetan people. Those who had given previous Nehru Memorial lectures included India’s President Mr Pranab Mukherjee last year and former President APJ Abdul Kalam before that. The Dalai Lama also attended the inaugural function of the World Hindu Congress being held in New Delhi from Nov 21 to 23.